In contrast, his equine namesake spent the final two furlongs of the Diamond Jubilee at Royal Ascot searching for an answer to the finishing kick of Twilight Son et al, eventually finishing a disappointing eighth of nine. There were extenuating circumstances there – he took a strong hold with no cover – and a repeat of his fourth in last year's Champions Sprint Stakes, or his impressive reappearance win in a listed race at Windsor in May, could well be enough to win Saturday’s Group 3 Hackwood Stakes at Newbury. However, despite topping the adjusted ratings and taking a big drop in class, James Fanshawe’s charge now has something to prove, and a better bet at current prices is Richard Fahey’s Mr Lupton. Despite being a year younger than The Tin Man, Mr Lupton has had 13 starts – five more than that rival – and his standout performance was achieved when winning a valuable handicap at York (by half a length from Dancing Star) in June. Dancing Star has since won a strong three-year-old sprint handicap at Newmarket, while the eighth-home, Sign of The Kodiac, also won on his next start. 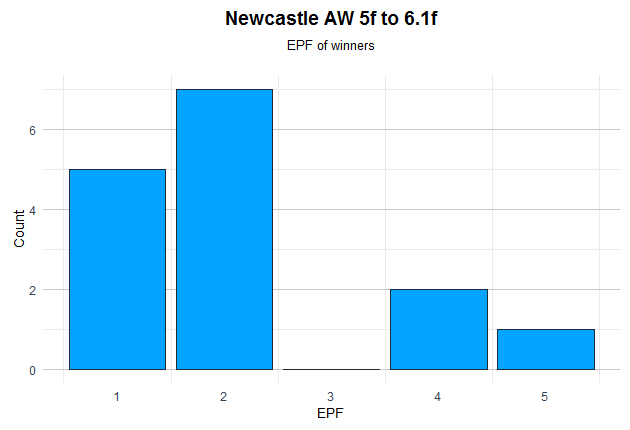 Group 1 Sprint Cup entry Mr Lupton was then better than the result when four and a half lengths fifth of 10 to Markaz in the Chipchase Stakes at Newcastle, not ideally placed towards the outside of the field and doing best of those who raced in mid-field. It appears difficult to come from off the pace on the new surface at Newcastle, especially in sprints, as the graph below illustrates. Incidentally, this is also a general pattern in sprint races. Mr Lupton was second in the Weatherbys Super Sprint at this course last season and his three victories have come at Haydock, Doncaster and York – all flat tracks which tend to suit horses with a turn of foot. Anyone who needs visual evidence of that attribute should watch a replay of his Doncaster win last September, where he had all but four of his 21 rivals to pass at the furlong pole but still managed to beat subsequent Derby fifth Humphrey Bogart by a neck. A strong pace suits Mr Lupton best and the presence of Watchable and Ibn Malik should ensure that this race is run at a true gallop. Watchable was one and a half lengths third of 11 to Don’t Touch in a listed race at Salisbury on his penultimate start and then finished ahead of Mr Lupton when a creditable two and a quarter lengths third in the Chipchase (Buratino seventh). The lightly-raced Ibn Malik won the listed Free Handicap at Newmarket in April and was then two and three-quarter lengths fourth of 19 to Ribchester in the Jersey Stakes at Royal Ascot, though he was suited by racing prominently in a race that wasn't run at a flat-out gallop in the latter race. Ibn Malik tries six furlongs for the first time in his career here but often travels strongly and the shorter distance shouldn’t pose a problem. Third behind The Tin Man and Mr Lupton on ratings is Charming Thought. Winner of the Middle Park Stakes in 2014 (beat Ivawood and Muhaarar), Charlie Appleby’s charge shaped as if he retains all of his ability when two and a half lengths fourth in the aforementioned listed race at Salisbury in June on his first start for 20 months and wasn’t unduly punished once defeat was inevitable. He wore a first-time tongue strap there and might well make up for lost time assuming he’s come out of that race okay. Illuminate is a smart performer who won the Albany Stakes at Royal Ascot and Duchess of Cambridge Stakes at Newmarket in 2015. She was a long way below form when well held in the 1000 Guineas at Newmarket in May but, similar to Lumiere – one of two horses she beat and who has since won a listed race on the July Course – was back to near her best when a creditable two and a half lengths fifth of 10 to Quiet Reflection in the Commonwealth Cup at Royal Ascot last time. She looks to be back on the right track. Mick Channon’s Divine impressed when winning the Group 3 Ballyogan Stakes at the Curragh in June but was below form when five and a half lengths fourth to Ridge Ranger in the listed Summer Stakes at York last time. Most of his future entries are over five furlongs and a bigger threat could be Aeolus, winner of the Chipchase Stakes in 2015, who, as a dual winner over the distance, will have no problem with the return to this trip. However, he ran one of his lesser races last time and now has plenty to prove.